For the Ice Cube song, see Why Me? (Ice Cube song). The song was performed seventeenth on the night, following the United Kingdom's Michael Ball with One Step Out of Time and preceding Denmark's Kenny Lübcke [da] & Lotte Nilsson [da] with "Alt det som ingen ser". At the close of voting, it had received 155 points, placing 1st in a field of 23. The song was succeeded in 1993 as winner by Niamh Kavanagh, also representing Ireland, with "In Your Eyes". Logan covered the song on his 2001 album, Reach for Me. ^ "Top 10 Denmark" (PDF). Music & Media. Retrieved 2018-03-21. ^ "Eurochart Hot 100 Singles" (PDF). Music & Media. Retrieved 2018-03-21. ^ "Ireland singles charts". Irishcharts.ie. Retrieved 2014-05-13. 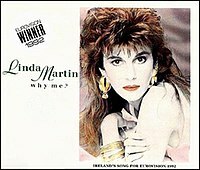 ^ "Linda Martin: Artist Chart History". Official Charts Company. This page was last edited on 20 May 2018, at 07:00 (UTC).